It’s pretty good and worth the price, I am a little dissatisfied with the quality o the materials used. But, you get what you pay for. 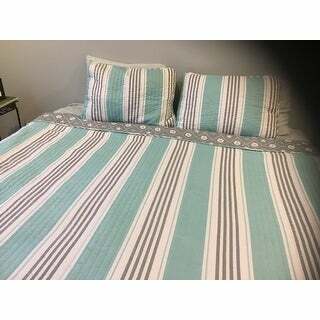 Decorate and enhance your bedroom, guest room, vacation home or beach home with this beautiful 3-piece quilt set. The fun coastal pattern will add the perfect finishing touches to your décor. Buy it for youself or as a gift for weddings, birthdays, holidays and more! Perfect match for my spare bedroom. Unbelievable price for a quilt of this quality. the quilt is soft and the colors are true to what was in the picture. I recommend this quilt for anyone looking for something pretty at a great price. This grey and blue light weight quilt is perfect for my room. I have it over a comforter so that it poofs up a little. This adds just enough design for my guest bed without being gender specific. Easy to wash and dry. Hold up very well in both. I bought this quilt in King. It came with two shams. Total cost was about 1/3 of the price (vs. big box bedding store selling a very similar style). Love the stripes and reverse shell pattern. It's perfect for a vacation home. Bought two twin quilt sets for grandkids guest room. The colors gray, coral and white stripes goes well for either a boy or girl guest. Very nice reversible design make it available to change it up in the winter months. The weight of the quilt is perfect. This quilt is just as pictured. I purchased the aqua and gray and it’s just perfect. I was looking for something easy to wash- due to my labradoodle always sleeping on the bed. This is functional and washes up great! ( I always wash things before using due to the chemicals used to store products) if you are looking for a little coastal charm without going over the top - this is a great choice. I would highly recommend. This set is not the highest quality, but it didn't cost much either. It is nice looking and the colors go well in the room it is in. It is being used in a guest room so it is fine. I do not think i would like it for regular use. I really like this lightweight, quilt-like, reversible coverlet. It looks great. I’m using it under my comforter as added warmth but also to give the made bed a more interesting look. It’s still new so I haven’t washed it yet to see how it holds up. The king size is not really wide enough to fully cover my split king mattresses — goes about halfway down the mattress sides. I can’t use it just by itself. I’m not really sure if it would work for a regular king, either. It says it’s 108” wide, so check your mattress size (don’t forget to include the mattress height). Otherwise, I’m happy with the purchase. This quilt is perfect for my son’s beach house guest room. The colors are perfect! I looked for a new quilt set for the bedroom in my new condo and this set is perfect. I love the color scheme and pattern. Great for any bedroom. I liked it so much, I bought two. It fits perfectly in my modern bedroom. Great quality for the price: I washed it a couple of times already and no issues. very soft and well made- very happy with this order and it arrived in 2 days! Haven't put this on my bed yet but I really like the design and the weight. I am going to launder it first and then I will put it on my bed. I am really excited. It matches the sheets I bought so well. I had been looking for something to match them for a long time. This was okay, I didn't really like the microfiber feel. I thought this was a traditional cotton quilt. It's a good value, perhaps for a quest room. This is a great quilt set! So soft and comfortable. You can’t beat it for the price. It looks nice too! I purchased the king size an the fit is perfect. Receive quilts when said they would be her. They are perfect for my grandsons room. They are gender neutral but look nice in a boys room.They are of nice material and look very nice on their beds. Very disappointed......I received a twin quilt when I ordered a queen. The package was marked queen but was only a twin. The quilt is not 100% cotton but a cotton/ployester blend. Buyer beware. I sleep with my dog and cat so I need quilts that are washable and not too expensive. I am glad to report this quilt actually cover's my king-size bed. I bought some quilts from another site that were inexpensive, so I can't complain. But they didn't even cover the mattress. I should have known to stick with Overstock. I've never been disappointed by any bedding from overstock. I bought this for my sister for Christmas. For the price I was a little doubtful on the overall comfort but I felt the material when it came in and it is so soft! Again, the price was amazing for the quality. "Is this poly and cotton or microfiber. Other sight have it listed as Polyester and cotton blend." "Is the picture blue/grey or aqua/grey." "Which way do the stripes go on the king size quilt?" It matches the theme of the bedroom I purchased it for.